Cho and Gracia bring the blockbuster action to “X-Men: Battle of the Atom”. Since Chris Claremont and John Byrne produced “Days of Future Past” in 1981, X-Men creators have been bending the space-time continuum in thrilling, albeit confounding, manners. Brian Michael Bendis’ innovative introduction of the original five X-Men from the past to the present in his “All-New X-Men” series reaches a turning point in “X-Men: Battle of the Atom”, an entertaining yarn that finds X-Men from three separate timelines doing battle with one another in the present. Considering the amount of time traveling and the number of time travelers that occur between the ten chapters of “Battle of the Atom”, the story is straightforward enough and mostly accessible to readers who may have been peripherally following the current “X-Men” series of books. * Bendis and co-writers, Jason Aaron and Brian Wood, have fashioned an entertaining X-Men story that crosses through their four X-Men books (“All-New X-Men”, “Uncanny X-Men”, “X-Men”, and “Wolverine and the X-Men”) flawlessly, by and large. The writing team focused their energies on spinning together an enjoyable and exciting story, filled with plenty of interesting revelations along the way. Once the story concludes, Bendis, Wood, and Aaron have laid the groundwork for the stories that will follow, but that doesn’t make “Battle of the Atom” any less satisfying. A small army of artists, inkers, and colorists are on hand to draw the sprawling adventure, and the artwork only falls flat once we reach the finale. Bendis and artist Frank Cho open the book with stunning wall to wall action as the original X-Men and Kitty Pryde find themselves surrounded by Sentinels while subduing a renegade mutant. The current timeline’s Cyclops and his team of X-Men arrive to save their overwhelmed counterparts. When young Cyclops is fatally wounded, reality begins to shutter and present day Cyclops disappears. The young hero is saved and all is put right, but it becomes clear to the X-Men that the original team may have overstayed their welcome. Wolverine, Kitty, and company decide that the teenagers ought to return to their timeline to prevent anything destructive from occurring to the existing timeline. Cho’s pencils are superb; he heartily embraces the massive action of Bendis’ script with a number of powerful two-page spreads. Marte Gracia’s colors are equally spectacular as he fills every crevasse of Cho’s pencils with sumptuous depth. Before the strangest super-heroes of all can be returned to their timeline, where the X-Men have unanimously decided to return them, a group of X-Men from the future appear with a dire message. Kate Pryde, Charles Xavier’s grandson, Deadpool, a Hulk-like Iceman, a female Xorn, Beast, and Molly Hayes from the Runaways have arrived to warn the present day mutants that the original team must be returned to their timeline or the future is doomed. Not wanting decisions to be made for them, and having little desire to return to what is in effect a death sentence for Jean, Scott and Jean make a run for it as “Battle of the Atom” begins a race across the mutantverse. Are these future X-Men who they say they are? Wolverine and Majik have their suspicions. What terrible event occurs in the future that would cause this antagonistic team of mutants to return to the present? At the book’s halfway mark we see the horrifying event, but the why said happening occurs and who causes it is left unrevealed. The big question of “Battle of the Atom” is whether or not the teenage X-Men should be returned to their timeline to have their minds wiped of everything they’ve learned about their futures. Over the course of the story, some of the X-Men decide that it should be up to the young heroes to decide for themselves. Sure, their existence in the current timeline makes for compelling stories, but wouldn’t everyone be afraid that their presence would eventually unravel all of their histories since they’ve up and left? “Battle of the Atom” never makes a compelling argument for the present day X-Men to allow their teenage counterparts to turn their backs on their destinies. Ice Master: And I wondered why I couldn’t keep a girlfriend… Bobby, Robert… please settle down. You’re embarrassing both of us. Immonen and Gracia introduce the future X-Men. Stuart Immonen is having as much fun drawing the almost snowman like Bobby Drake as Bendis is writing in writing the character. Likewise, the artist’s chapters are equally as astounding as Cho’s. 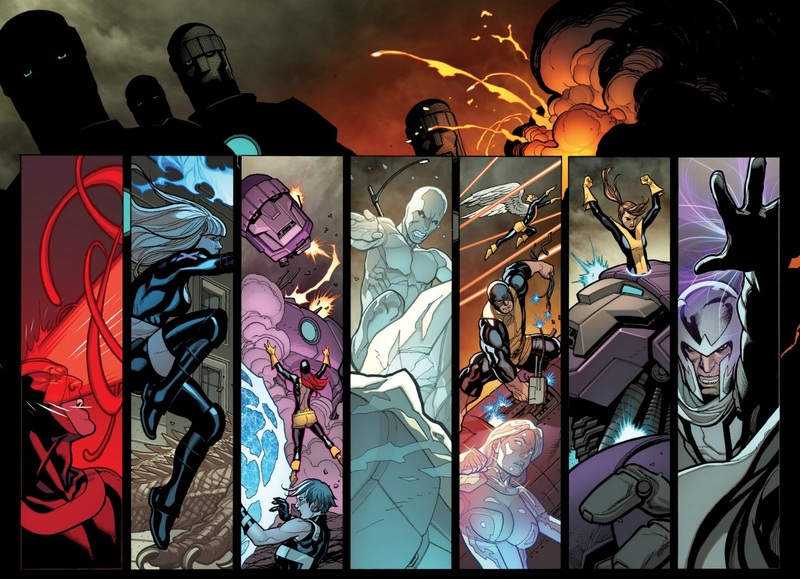 Immonen also brings the blockbuster sensibility to the sequences of the story for which he is responsible. Chapter six involves the destructive event that has brought some of the future X-Men to the present and Immonen creates a horrifying nightmare that makes it easy to understand why these mutants are so impassioned. Again, Gracia’s color work is exquisite, from the horrific red tones employed in the nightmarish future sequence to the liveliness of the colorist’s palette during the meeting between the time-displaced X-Men and more future X-Men. Unfortunately, Giuseppe Camuncoli’s artwork in chapters nine and ten falters in what would seem to be the pressures of a tight deadline. The panels are standard and there is nothing impressive about the artist’s action in these chapters. Esad Ribic’s work also appears rushed in Chapter 10, but not terribly so. Ribic still manages to find exciting angles even if his line work is a mite simpler than what we have come to expect from the artist. 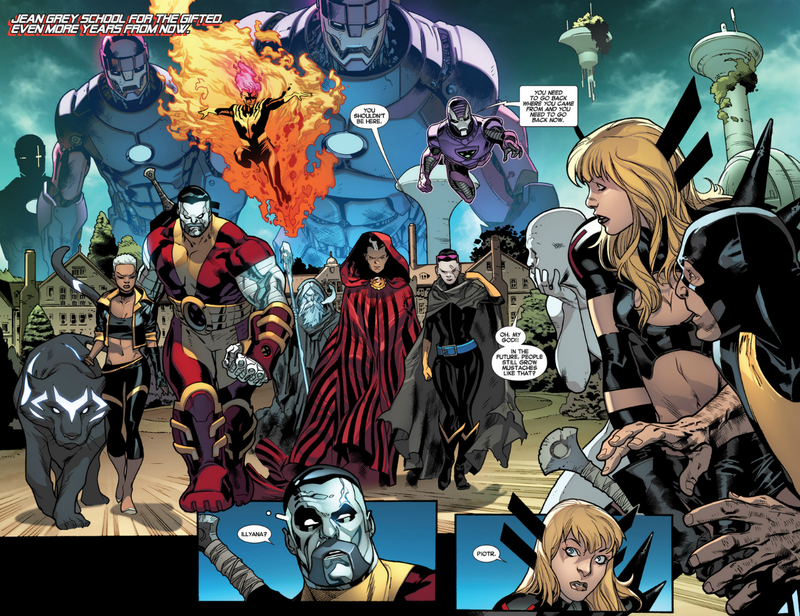 By the close, two factions of mutants from the future are doing battle with two factions of X-Men in the present, with the original five X-Men caught in the middle of the maelstrom. It all leads to a few fatalities, some team changing, and weighty decisions by major characters. Ultimately, the current X-Men status quo receives a minor face-lift with the promise of more drama ahead for our family of mutants. Once again, I didn’t buy a major character’s choice at the end of the story. Yes, it will make for some interesting stories, but considering what the X-Men have been through in the last two years, it seemed like an improbable conclusion. Bendis, Aaron, Wood, and team guarantee that the rollercoaster never slows down too long as they continue to throw more twists into the mix. By the conclusion, each writer has planted enough seeds to compel readers to follow up with each of their respective titles. Perplexing decision making aside, “X-Men: Battle of the Atom” is a genuinely fun ride, written in the spirit of the very best X-Men epics. *If you really haven’t been paying much attention to “X-Men” titles for the last few years, I would recommend picking up “X-Men: Schism” (2011) and “Avengers vs. X-Men” (2012) for a solid understanding of the status quo depicted in “X-Men: Battle of the Atom”. Collects “X-Men: Battle of the Atom” #1-2, “All-New X-Men” #16-17, “X-Men” (2013) #5-6, “Uncanny X-Men” (2013) #12-13 and “Wolverine & the X-Men” #36-37.